A new goal I made a few years ago was to start incorporating green smoothies into my breakfast routine. I started slow with a few smoothies per week. When I realized how they made me feel, I eventually started drinking green smoothies every morning, with an occasional skip for waffles, French toast or poached eggs. Getting Rob to accept green smoothies was a challenge. At first he turned his nose up, totally; after all, green smoothies are not regular (his word). Then I discovered adding a date or two, plus a frozen banana, sweetens green smoothies right up. He finally joined the morning smoothie party! Although I still hear about it when I try sneak in some wheat grass or parsley. My efforts continue. Sometimes it’s daunting to look beyond the indulgent, rich, albeit delicious eats the holiday season brings. In our hurried days, it’s easy to get off track; a little here, a little there… and then it starts adding up. This is when I look to the freshest of greens and in season fruit to refocus my efforts when I get off track (ie too many cookies and indulgent breakfasts!). Most of our local food during the winter months comes from our neighbors to the South, California and Mexico, with a few exceptions like carrots, beets, and parsnips. The greens here, for the most part, are pretty much done. Otherwise I’m pulling from my stock of local potatoes, onions, squash and frozen veggies from summer and fall’s bounty and I make the one hour drive to our nearest Co-Op about once every other week; a monthly trip in the summer. They have a wide selection of beautiful greens and the best citrus I can find anywhere! Whole9life.com shares a printable PDF for seasonal eating, one I like to refer to. Also, to find local farmers markets, believe it or not, there are still some going on, and where to purchase community supported agriculture, local harvest can help guide you. Many start up in Spring, so now is a good time to start planning. Until then, I am forever grateful to our breadbasket, California, for continuing to produce year round abundance for our table despite the challenges California farmers face. 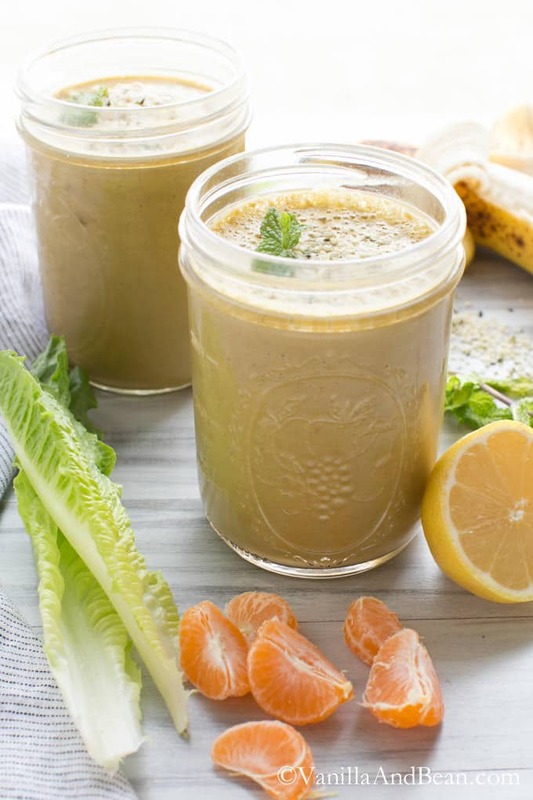 Romaine is a neutral tasting lettuce, so the citrus shines in this smoothie. The hemp hearts add creaminess and a punch of protein to keep you satiated through the morning. If you’re introducing smoothies into a new routine for your family, I find dates help make this transition easy because of their sweetness. Now that I’ve been drinking smoothies for so long, I’ve gotten used to their mild sweetness without the dates. Play with the ingredients, though, to suit your tastes. This smoothie is rich, mildly sweet, minty, and creamy. Small changes every day add up to big changes over time. Green smoothies really do make a difference! Creamy, minty and filling, this smoothie is refreshing in the morning for breakfast or for an afternoon pick me up! Delicious and nutritions anytime. Wash all fruits and veggies. Place ingredients in a high speed blender (I use Vitamix) and blend until smooth. Best enjoyed right away. How much matcha do you put in the smoothie? Hi Shannon. There is no matcha in this smoothie. The green comes from the romaine lettuce. But, if you wish, 1tsp latte grade would be a delicious addition! I made this smoothie a few days ago and simply LOVED the taste! I have to admit, I am not sure what kind of oranges I used, they looked Mandarin – I will need to find out from the farmers market next time I visit. I am looking forward to trying your other smoothies! This looks so refreshing and nutritious! I love finding new ways to make a healthy smoothie. Great that you use local and fresh produce, thanks for the resources! Hi Traci, this is my first visit to your blog. I came across your beautiful smoothie and wanted to drop in to tell you how much I’m enjoying the ingredients you’ve assembled for it. We have a mandarin tree in our backyard that is simply bursting with fruit — I have a hard time keeping up with the harvest and preventing waste despite sharing a great deal — so this is giving me further culinary inspiration. Your photos are just lovely too. 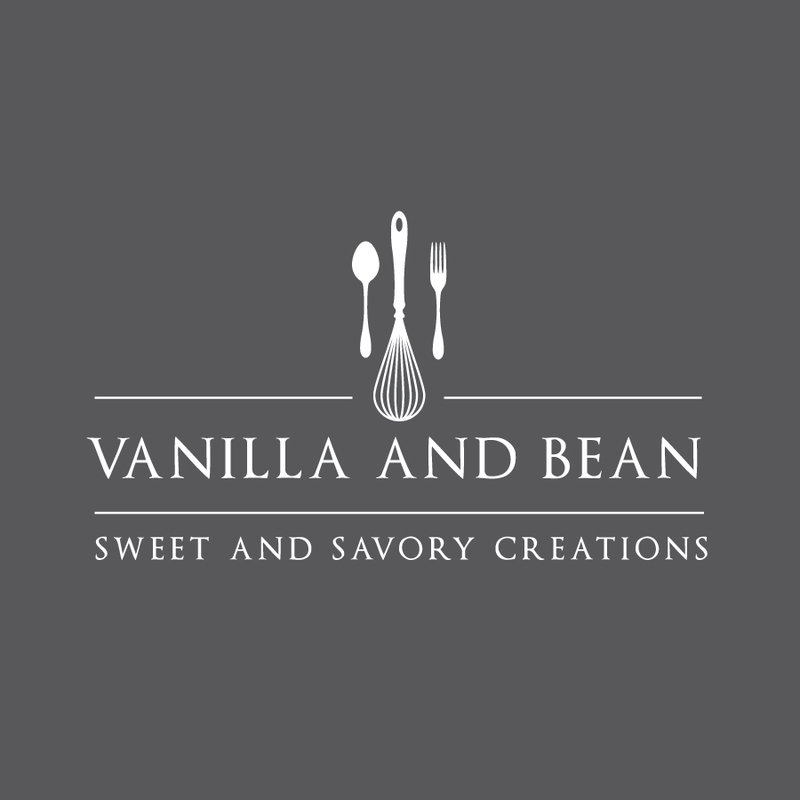 I will be sharing a number of your recipes on my Pinterest boards. Pleasure connecting :). Hello Kelly! Thank you for stopping by and your kind note. Oh how I would love a mandarin tree in my yard. I think I would literally drink the entire tree! I long for good citrus and sometimes it’s hard to come by where I live. In fact, I can’t find fresh, organic, mandarins any longer. They’re so sweet. Perfect. I’m happy to hear my recipe will help you enjoy them! Thank you for your pins, Kelly. 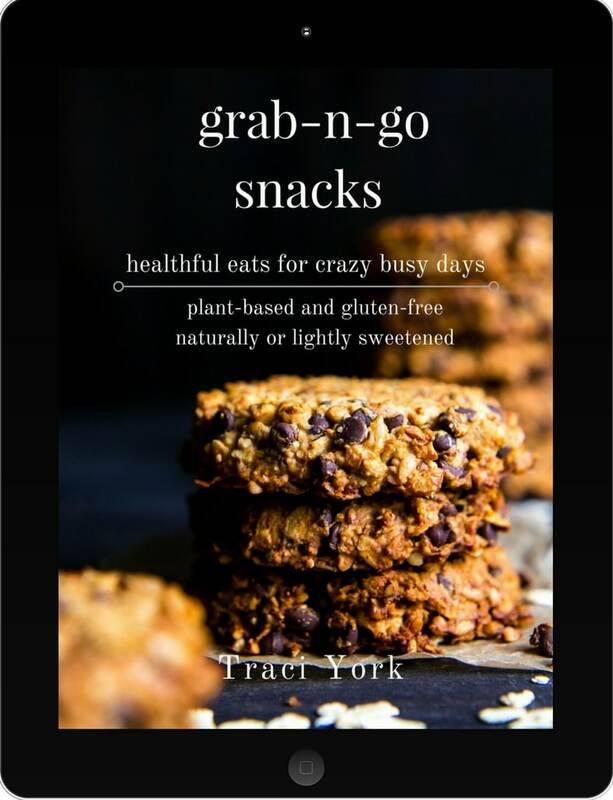 What a delicious and healthy recipe, Traci! The orange with the banana and date reminds me a bit of an orange creamsicle (but healthier, of course!). It’s always fun to sneak in so many healthy ingredients like lettuce to smoothies, too. Also, I love how you focus on eating seasonally, which is something I really want to start working on. Very inspiring! This looks so refreshing an delicious! Looking forward to more! Wow, I never would think to add romaine to my smoothies, but I need to go do it now. I am also trying to stick to some in season and local foods, so I rejoined my local co-op. I will have plenty of ingredients to make this delicious smoothie! Pinning for later. Wait- did the sludge get a makeover?! 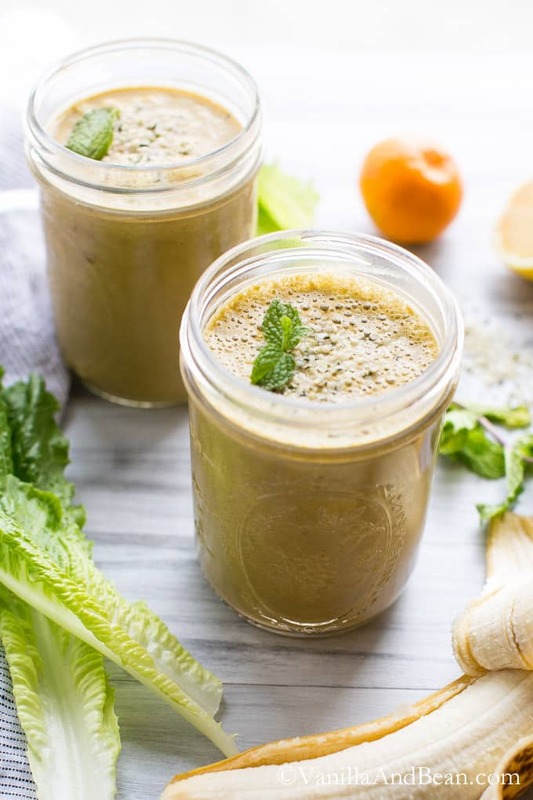 Ginger and citrus is such a happy, energizing combo. And look at those gorgeous carrots! I’ve tried PicMonkey before to make collages for the blog. I have absolutely NO CLUE how to do it otherwise- tech stuff is not my strong point! But sadly, their website was not compatible with my old browser (which I couldn’t update) so I had to ditch it. I have a new computer now so maybe I’ll re-visit! Thanks for the tip. Yes! I love ginger in my smoothies! That looks super delicious, I love citrus, mint and ginger – bet it is so good for you too. Don’t worry, I’ve never heard to picmonkey before now! And by the way, I’ve used pic monkey and like it! It is easy to use and free! These smoothies look fantastic Traci! We have smoothie for breakfast at least every other day! Never made one with romaine, since I always use spinach of kale for green smoothies. Will definitely try this one! Great flavors – ginger, mandarin oranges and mint – I love it! Thank you, Mira! I used to never use romaine.. always spinach. But then I wanted to add more variety to my smoothies, so I started trying different greens and wallah! Romaine! And it’s a fantastic green and is has a neutral taste so it pairs well with a variety of fruits when you really want the flavor of the fruit (and herbs/spices) to shine. 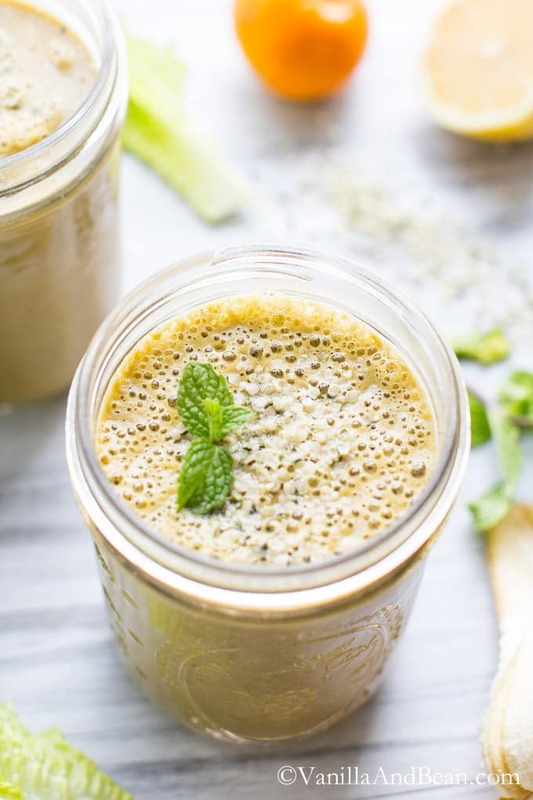 I love the citrus, ginger, and mint flavor profile you’ve made for this green smoothie. I also love the story of converting your husband to smoothies – my husband is actually the one in charge of our morning green smoothies every day! Your husband’s word for green smoothies makes me want to say “but they’ll make you regular” (yes, I went there;). Love the banner, love the recipe, love the local/seasonal suggestions. Most of all, I love your scrumptuous pictures of the food. Thank you for the beautiful, sunny images on a brutally cold winter day! This is so vibrant! A much needed fresh flavor boost in the cold winter months. I love your photography! These flavors sound so energizing! I’ve been on a smoothie bender ever since the holidays too. I don’t get what “not regular” means, lol, but it sounds like your fella’s really missing out to me! O is actually pretty adventurous when it comes to “healthy foods” and I got him totally hooked on green smoothies! To the point that the man runs the Vitamix every morning and wakes me up with that airplane engine-inspired whirr. I love the idea of using romaine here – good for avoiding the goitrens that seem to follow me everywhere. Also.. hemp seeds! Why do I never use them?! This sounds delicious again, Traci! I love the combination of mint and mandarin! 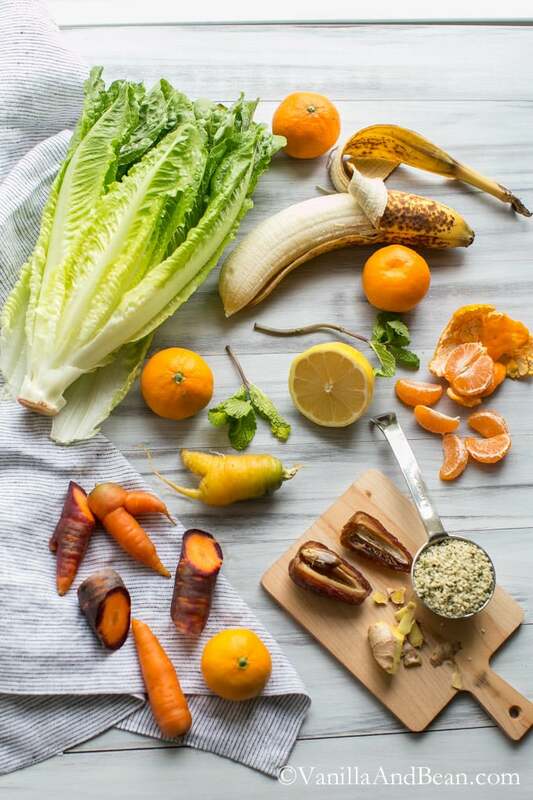 Smoothies are one of my goals this year too – so will be adding this great looking smoothie to the rotation. I’ve never tried romaine in a smoothie – it wasn’t even on my radar. I always have some in the fridge so this will be a good way to use it up. Lovely pictures, Traci.